Working with several clients or partners might be an interesting challenge sometimes. While adding a new connection to an existing OpenVPN infrastructure I came across the following error message in the client log file: All TAP-Windows adapters on this system are currently in use. Depending on how you actually installed your VPN client software you might be facing this issue while adding an additional client configuration for another connection. Especially when you are using a client software by a third-party provider, ie. WatchGuard Mobile VPN or Sophos. Perhaps you might be struggling to resolve it. 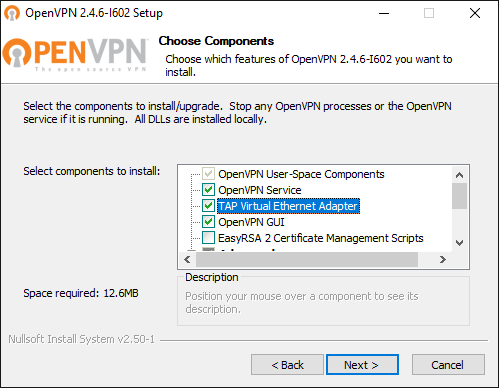 Check whether you have the full installation of OpenVPN software. 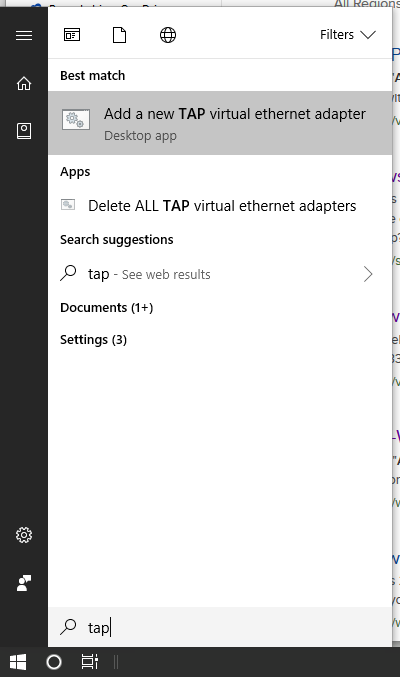 If yes, you might like to skip this the following steps and directly move on to add another TAP adapter to your Windows system. You might have to reboot Windows to complete the network driver installation. 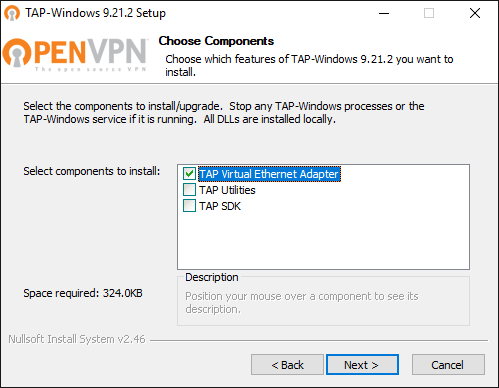 Click on the entry Add a new TAP virtual ethernet adapter and confirm the User Account Control (UAC) dialog with Yes. You then see an administrative command prompt that adds another network interface to your Windows. Updating drivers for tap0901 from C:\Program Files\TAP-Windows\driver\OemVista.inf. And your OpenVPN client is ready to roll. Note: Ensure to run the batch file with administrative permissions. Otherwise, the driver installation will fail. Perhaps you would like to inspect the existing TAP-Windows Adapters? You find them in the Control Panel under Network Connections. The adapters are classified as TAP-Windows Adapter V9. Here you can enable, disable or even delete an existing network interface. The information provided is identical to the visual representation in Windows Explorer. It's been a very long time since I set up the VPN infrastructure at the office using OpenVPN. Today, I came across an interesting log entry that I would like to document quickly. Tue Aug 28 08:50:09 2018 WARNING: INSECURE cipher with block size less than 128 bit (64 bit). This allows attacks like SWEET32. Mitigate by using a --cipher with a larger block size (e.g. AES-256-CBC). Tue Aug 28 08:50:09 2018 WARNING: cipher with small block size in use, reducing reneg-bytes to 64MB to mitigate SWEET32 attacks. The default encryption for the transport protocol of OpenVPN is Blowfish – a 64-bit cipher – with the CBC mode. Meaning, the default encryption of OpenVPN prior to version 2.4 is BF-CBC which doesn't provide enough security in recent times. Newer versions of OpenVPN though are using AES-256-CBC as default cipher. For your own sake and safety of your network(s) you should check and change your OpenVPN infrastructure right away, and if needed upgrade your defined cipher to a more secure encryption and larger block size. Depending on your underlying Linux system the list might be more or less exhaustive. Have a look and then choose a key length of at least 128 bit. OpenVPN currently recommends using AES-256-CBC or AES-128-CBC. Following the article on OpenVPN and SWEET32 I chose to use AES-256-CBC cipher suite for my existing infrastructure. This seems to give me the largest compatibility between OpenVPN installations on various clients, including Raspberry Pi. This needs to be applied on the OpenVPN server first as well as on all OpenVPN clients. Save your configuration file and reload the new settings. This way you are able to find out which clients are still running on the previous configuration and therefore would need a little bit of assistance. Thanks to some of the clients of my company IOS Indian Ocean Software Ltd. it happens that I have to connect to their networks via VPN from time to time. Given the changed cipher of my own OpenVPN infrastructure I wanted to see what others are using. Well, looks like I'm in good company with my new option. Again, lesson learned. Although running services on Linux is mainly about setting them up properly at the beginning, it surely doesn't mean to forget about them in the long run. Regular reviews and audits help to mitigate newer issues and threats to your network infrastructure. If you are an active OpenVPN user please use the comment section to share other security related configuration settings and hardening tips on OpenVPN. That would be much appreciated by myself and other readers. Thanks!